With spaces in her memory, she could only confirm what she knew. According to her, she's undergone three surgeries to remove tumours and says her parents are named Norris and Celia Anderson, also stating she was born near Silicon Valley. She is blind one eye and has messy pale colored hair, along with scars and her eyes being blue. 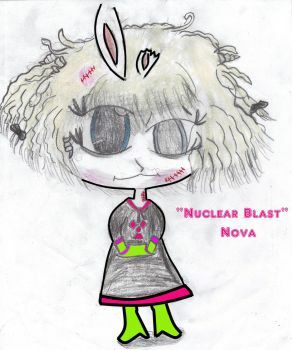 Generally, she is seen in a hooded black shirt with a neon pink radiation symbol it and neon green boots and gloves. She is noted not to be quite right in the head, however, she is noted to painfully reckless and has no comprehension of her actions with small bursts of rationality. She is also curious and has a special brand of "misguided" kindness.